Hole on the wooden stick moves, slides, and even jumps! The magician shows a small wooden stick that has one hole, and one string is threaded through the hole. The string is removed from the hole, which is his cue to the audience for the start of a breathtaking show. He covers the hole with his palm. In the next moment, he shows that the hole has moved to the other end. He places his finger on the hole, then slides it to the other end… Along with the finger, the hole as well slides to the other end! To prove that the hole is NOT fake, he can thread the string through the hole. Finally, he shows the effect without covering the hole. He gently shakes the stick up and down. In the blink of an eye, the hole on the stick jumps to the other end!!! The design is simple, yet it contains a super precise gimmick! 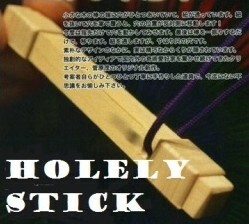 Comes with “HOLELY STICK” and instructional video. In addition, you will receive non-gimmicked stick for advanced routine. (switching out is required for examination). Made of Cypress Wood, which is one of the best woods. If you have ever purchased Tenyo’s items before, you have seen his name at least once, on such items as “Fortune Donut”, “The Gorilla Bar”, “Squeeze Play”, etc….. The Success of Tenyo would be impossible without Sugawara.